Autoflowering strains have seriously stepped it up in terms of quality, quantity, potency and flavour. Below is a list of the top 5 autoflowering strains you should consider in 2018 if growing indoors, outdoors and in greenhouses. Auto Lemon Skunk is a strong, sturdy producer that performs very well in all climates, and is especially adept at tolerating cold conditions. This autoflowering strain from Seedman is a cross of Lemon Skunk and Lowryer, which makes this a great choice for anyone who loves citrus lemon terps and a powerful, strong effect that is naturally high in CBD. This strain has a narcotic edge and despite it being a Skunk hybrid, it will certainly deliver in terms of potency and medicinal value. A short flowering time of 7-9 weeks makes this strain another great one to grow multiple times throughout the year. A sturdy, great producing autoflowering strain that every grower should add to their collection of autos. 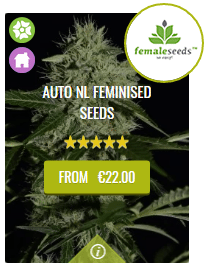 Buy Auto Lemon from Seedsman here. Auto Northern Lights is, as you would expect, an autoflowering version of the super reliable and mould resistant Northern Lights. Well known for its potency and great yields, this indica autoflowering variety will deliver tough strong plants that will remain between 40 cm and 80 cm, making this a well recommended variety for stealth growers. The flowers retain an earthy sweetness with resin coated buds that when smoked will leave you couch locked and fully medicated. Expect good yields of small dense indica buds with an average of 50-60 grams per plant. Highly recommended for growing indoors, outdoor and greenhouses and for new growers who want something that is a steady and solid plant. Buy Auto Northern Lights from Seedsman here. This autoflowering strain from Dinafem Seeds won 1st prize in the auto category at the 2016 Lift Cannabis Expo in Toronto Canada, so already has overseas recognition. A very earthy and zesty haze variety, the genetics are Sour Diesel crossed with a Haze 2.0 Auto. You can expect this plant to finish quite tall at a height of 160 cm and hold large robust yields of up to 150 grams per plant. The flowering time is a short 10 weeks, so this is quicker autoflowering strain than some other autos and can be more generous in terms of the powerful and long lasting high that it has to offer. The genetics are a mix of indica and sativa so anyone looking for the best of the Diesel strain and the racey sativa influence from the Haze will not be disappointed. Buy Sour Diesel Auto from Seedsman here. If you are a lover of Diesel or Sour Diesel, then this autoflowering version of the strain, is perfect for you. This strain is a cross of the New York City Diesel crossed with a Lowryder and produces consistent, uniform plants that will grow up to 100 cm tall, whilst producing good yields of gassy pungent fuel. This autoflowering strain has a short flowering time of around 63 days, meaning indoors and outdoors you can grow multiple cycles in shorter time periods. The effect is dreamy and euphoric and the taste is the classic diesel that we have all become accustomed to. Buy Diesel Auto from Seedsman here. This is a classic strain which is well known to excel when grown outdoors and in sunny climates. A mostly indica autoflowering strain, you can expect to grow a plant that is medium in height with a thinner structure to other autoflowering strains. At a maximum of 90 days from seed until harvest, Auto White Widow will produce potent, musky, earthy and frosty buds that are of a classic white widow flavour. The yield is generous and an experienced grower can expect yields of up to 125 grams in the right climates. This autoflowering strain can be grown indoors, outdoors and in green houses and has high resistance to the cold weather, making this an excellent autoflowering strain for beginners as well as expert growers. 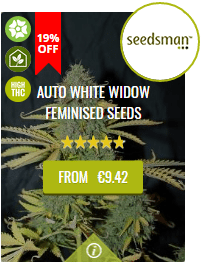 Buy White Widow Auto from Seedsman here.